Employee’s call off sick and/or late every day and if you’re an employer with a large workforce this is a major issue that negatively impacts your company’s work-flow, production and ability to meet deadlines. 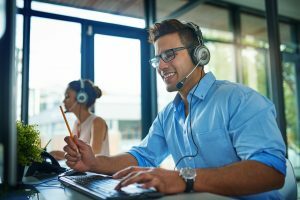 Managing employee absenteeism doesn’t have to be difficult, especially when you enlist the support of a professional employee hotline/reporting service. An employee reporting hotline is a dedicated telephone number that an employee calls to report their absence or tardy. One of our professionally certified call agents will gather your specific information and dispatch the message to the appropriate shift supervisor/department­ — in real-time. Our advanced call center technology allows us to document the telephone number the employee called from, record the call, time/date stamp it and provide a confirmation code to the caller. It’s the perfect solution for ensuring accuracy and compliance with your employee documentation process. It’s important to mention that we can help you improve your internal tracking process by providing you with daily call reports. These custom reports can be sent either by email or text and better yet, you can even log in to our secure web portal and review. The same process is used for issues other than attendance such as ethics, whistle-blower, harassment, etc.